» What Influences International Differences in Broadband Prices? Broadband prices differ significantly throughout the world. However discussion of factors influencing international differences receives limited attention in the academic and policy literature, which is largely concerned with broadband prices in particular countries. Focussing on landline broadband, this exploratory article helps fill a knowledge gap by discussing some methodologies for comparing broadband prices between countries, and suggesting five factors that influence broadband prices: supply, demand, governmental policy and regulation, average price level throughout the economy as a whole, and physical/infrastructural factors. In this discussion, we also examine where Australia sits in relation to global broadband prices. Broadband prices vary significantly throughout the world. In Ukraine, for example, the monthly price for an unlimited 10 Mbps landline connection is about 3.4 USD, very cheap by comparison with Australia, which is typically 54 USD (Numbeo 2016). However, in Bolivia, although average income levels are close to those in Ukraine, the monthly price for 10 Mbps is 81 USD, which is very expensive by comparison with Australia (Numbeo 2016). Why such dramatic variations? What factors influence such significant difference in prices for basically the same service in different countries? The direct comparison of absolute prices for broadband provision, which is the typical measure used by popular broadband ?league tables? is not very informative without considering other factors that influence broadband prices. While these comparisons show significant variation between countries, they provide limited explanation of why this is so, or how such comparisons are arrived at. The published literature in this field has also paid little attention to factors that influence broadband pricing in international comparative terms, focusing instead on broadband penetration, policy and regulatory, and marketing issues. This exploratory article helps fill a knowledge gap in this area by discussing methodologies for comparing broadband prices between countries, and identifying some factors that influence broadband prices. In doing so, we also examine where Australia sits in relation to global broadband prices. In this article the term ?broadband price? means the approximate average cost of a landline (fixed) broadband connection in a given country. In the numerical examples we use data from OECD fixed (landline) broadband basket ?Med 4? (short for Medium 4: there are six grades in each of three OECD landline broadband baskets: low, medium and high). The Med 4 basket refers to a monthly data allowance of 50 GB with a speed of 25 Mbps and above, delivered across cable or ADSL. We also we use data from Numbeo (i.e. a crowd-sourced global database of different statistics) which refers to unlimited data at 10 Mbps speed, cable or ADSL. These sources estimate average landline broadband service in terms of data speed. When we refer to broadband prices in general without mentioning any numerical examples, we mean the average trend (e.g. broadband prices are higher or lower in country A than in country B). The data from OECD and Numbeo sources are illustrative (rather than definitive); however, they are useful in reflecting overall trends in landline broadband prices for the countries mentioned. The structure of the article is the following: first, we provide an overview of the relevant literature on broadband price, then discuss the relationship between broadband prices and international price levels. Having observed the variations evident from this simple or unadjusted price comparison, we then examine adjusted broadband prices by introducing the concept of perceived price, seen through two indexes: the ratio of broadband price to average wage, and the ratio of broadband price to Big Mac. The article then suggests five major factors that influence differences in international broadband prices. These are supply, demand, governmental policy and regulation, average price level and physical/infrastructural factors. Although some of these factors are discussed in the literature, they are generally considered under the banner of broadband penetration, which provides a limited and indirect insight to comparative broadband prices. The extensive governmental and industry data on broadband includes price along with a range of other indicators (penetration, speed, demographic influences, uptake by population cohort, spatial characteristics of provision, and so on), but pays limited attention to specific factors influencing price, (see for example Organisation for Economic Cooperation and Development (OECD 2016a; 2016b), International Telecommunications Union (ITU 2015), the Federal Communications Commission (FCC 2015), Regional Telecommunications Independent Review Committee (RTIRC 2015), and Akamai (2015)). The emphasis in the policy literature on determinants of broadband penetration (generally measured by subscriptions) provides some useful, if indirect, insights on factors influencing price. However, the existing literature contains some inconsistencies that point to a requirement for detailed empirical research on price factors. For example, Flamm (2005, p.36) argues that ?two factors often associated with broadband penetration, income and population density, unsurprisingly seem to be among the most important determinants of broadband penetration?. However, the OECD (2016c) finds a relatively weak positive correlation of .35 between density and penetration. Bouckert et al. (2010), Falch (2007) and Polykalas & Vlachos (2006) identify regulatory and market settings as significant determinants of penetration. The spatial dimensions of the ?digital divide? have been a persistent concern of academic analysts and governmental bodies, and some of this literature has drawn attention to differences in broadband prices and speed between urban and rural areas (Schneir & Xiong 2016; Rogers 2016; RTIRC 2015). Polykalas & Vlachos (2006) examine broadband competition and broadband penetration in fifteen member states of the European Union (EU) that share the same regulatory framework. These authors analyse such factors as the existence of alternative infrastructure, the level of broadband competition and the historic evolution of broadband penetration, and conclude that broadband penetration and long term growth of high quality broadband services is stimulated by competition. Drawing on UK Office of Communications data (Ofcom 2011), Curran & Poland (2011, p.34) also conclude that ?high competition levels lead to high penetration ratios and particularly only the competition in the access market could guarantee a long term growth of high quality broadband services?. Falch (2007) finds that policy settings in the EU, South Korea, Japan and US have influenced national differences in broadband penetration. While factors such as the macro-economic environment and demographics are largely beyond the influence of government, Falch argues, policies on broadband infrastructure and access, and longer-term programs such as education, were also important factors in broadband penetration. Where Flamm (2005) found that level of income was a significant determinant of broadband penetration, Falch (2007) found that it was not a decisive factor in explaining national differences. There has been long-standing academic interest in examining broadband investment strategies and pricing models from the perspective of broadband providers. McLean & Sharkey (1993) deploy game theory methods to investigate broadband prices for a regulated telecommunications supplier offering heterogeneous services on a broadband network. Falkner et al. (2000) provide an overview of pricing concepts for broadband IP networks, while Biggs & Kelly (2006) examine the relationship between pricing strategies and the growth of the broadband market within countries. Nevo et al. (2016) analyse usage-based pricing for residential broadband and conclude that the investment in fibre-optic networks is likely to be recoverable in some markets. While this review is necessarily brief, it is sufficient for us to conclude that Flamm & Chaudhuri?s (2007, p. 314) observation that ? [p]rice, though theoretically the most interesting determinant of Internet service choice, is also the least explored and understood? still holds some truth. Price is widely acknowledged as a factor in broadband diffusion or penetration, but there have been few attempts to examine in detail the determinants of broadband price or differences between countries. Before we analyse factors influencing broadband prices, it is useful to set the scene by comparing prices between countries. To undertake this task accurately, the basis for comparison should be consistent. This is complicated by different broadband technologies (ADSL, fibre, cable, fixed wireless, mobile wireless etc.) and different service levels (in terms of bundled services, speed and data caps). Price comparisons are available from multiple sources, ranging from standard governmental and industry bodies (OECD 2016a; ITU 2015; Akamai 2015), to the crowd-sourced global database of reported consumer prices and other statistical data Numbeo (Numbeo 2016). For the purposes of this article, we mainly refer to the data provided by the OECD, which is precise and detailed, and to Numbeo, which is the most current data source on broadband prices throughout the world. An important context in which to view broadband prices is the wider level of prices of different countries. This means that the effect of the comparatively large GDP per capita (and thus the average income) in developed countries might be partially offset by the comparatively high cost of broadband access in those countries. This is referred to as the Penn effect: a rich country (compared to a poor one) appears to be wealthier than it really is (Samuelson 1994; Summers & Heston 1991). For example, 100 USD in Bolivia or Ukraine has greater consumer purchasing power than in Australia. To adjust for the impact of relative values of different countries on GDP, the concept of GDP per capita, ppp (gross domestic product adjusted to purchasing power parity) is used. Generally, GDP per capita is greater than GDP per capita, ppp in wealthier countries while in middle or low-income countries the opposite tendency occurs (see Fig. 1). 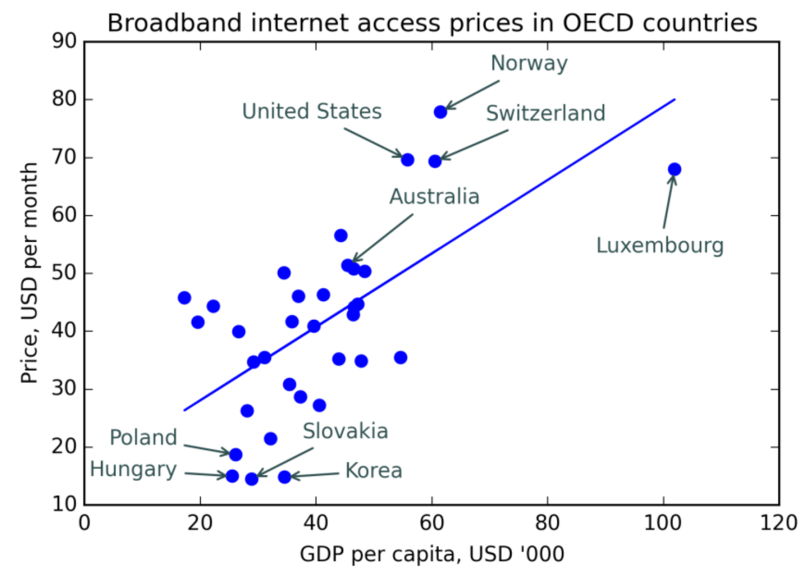 The cross-country broadband prices and GDP per capita statistics suggest that broadband prices throughout the world are subject to the Penn effect (see Fig. 2). As we can see, generally the wealthier is the country (in terms of GDP per capita), the higher is the price for broadband. For example, Poland, Hungary and Slovakia, which are all in the bottom-left corner of the plot, all have comparatively low GDP per capita and broadband prices, while Norway, Switzerland and Luxembourg enjoy comparatively high GDP per capita levels and broadband prices. Roughly, the countries which are above the trend line have comparatively more expensive broadband (with respect to GDP per capita level), while states below the trend line enjoy comparatively less expensive broadband. Among the former are Australia, Switzerland and USA, among the latter are Korea, Slovakia and Poland. Luxembourg is also below the trend line despite its quite high broadband price due to its strikingly high GDP per capita level. The difference between GDP per capita and GDP per capita, ppp reflects the difference in price levels between countries only partially, as factors such as the level of incomes (described as the Penn effect), the peculiarities of local economies (for example, differences in the costs of labour and capital) or inflation may also significantly impact broadband prices. To make the difference in price levels in different countries more comparable, the OECD publishes a monthly comparison of price levels based on exchange rates, evaluating the same representative basket of consumer goods in every OECD member country (OECD 2015a). To better explain the differences in price levels between different countries, in 1986 The Economist introduced its Big Mac index (The Economist 2013). The Big Mac index appears to be a good proxy for comparing price levels in OECD countries. In June 2016, correlation between the Big Mac index and OECD comparative price levels was 0.84 (calculated on data from OECD (2015a) and The Economist (2013)). 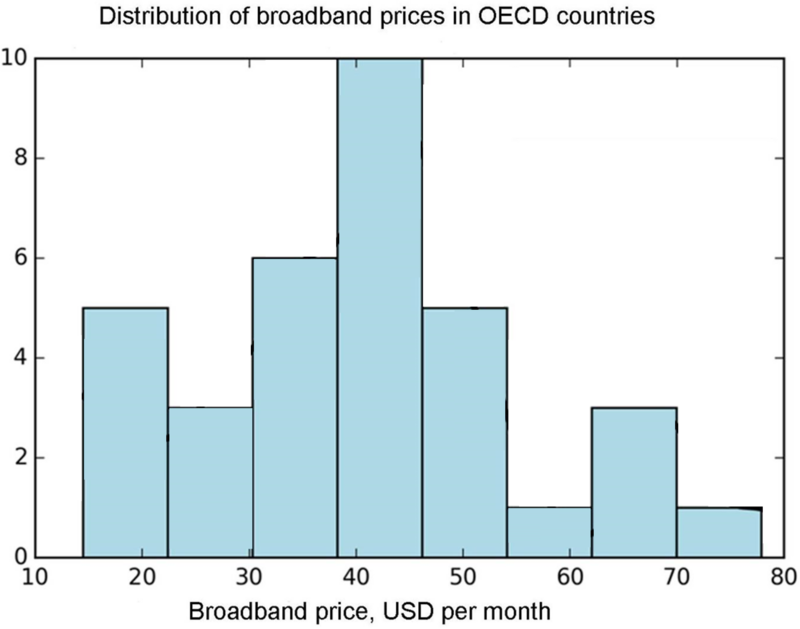 Correlation between the prices of broadband provision in OECD countries and OECD comparative price levels is lower, sitting at 0.61 on the scale, possibly because the factors that determine broadband prices in OECD countries are less standard than the factors which determine the prices for burgers throughout the countries (calculated on data from OECD (2015a) and OECD (2016a)). If we go beyond OECD states and examine the broadband prices and comparative price levels (for which we deploy ppp as a proxy) for a broader list of 124 countries (countries from the Numbeo database), we find there is an insignificantly low correlation between broadband prices and purchasing power parity rates. This suggests it is likely that factors determining prices for consumer goods, and prices for broadband provision, differ significantly. Thus, we might look to factors such as income level, geography and demography, infrastructure provision, regulatory and market arrangements, and perhaps other factors, as broadband price determinants. To summarise, the broadband price in OECD countries is mostly determined by the factors akin to those that determine prices for consumer goods (but to a lesser extent than a Big Mac is). However, analysing a wider range of 124 countries (for which Numbeo data is available), we hypothesise that factors other than those influencing the price of consumer goods cause broadband prices to deviate significantly from the price of consumer goods. This formula rests on a presumption that the more people earn, the less is the subjectively perceived price for a service or commodity. In a marginal case, if someone has an infinite sum of money, they may not care about prices at all. This exercise ranks Australia ninth among the OECD ?cheapest? broadband countries (or, more precisely, among the countries with the lowest ratio of broadband price to average income rate). The first-ranked countries, that is, those with the lowest price/income ratios, are Korea, Finland and Ireland. Australia sits one rung below Japan. The countries with the highest perceived broadband prices are Portugal, Chile and Mexico. The results are set out in Table 1, with the distribution of prices shown in Figure 5. Source: Broadband price: OECD (2016a), OECD (2015b), author calculations. However, if we perform the same exercise with Big Mac prices (i.e. divide the Big Mac price by average income rates in corresponding countries), we find that Australia has the lowest price/income ratio, followed by the Netherlands and Sweden. This suggests that broadband prices in Australia are ?higher? than prices for hamburgers (considering the scale and the relation to the average level of prices). An alternative way to investigate comparative broadband prices is to plot where prices in each OECD country sit with regard to the average price level (for which the Big Mac index is proxy). To investigate this, we divide the broadband price by the Big Mac price in every country, choose the median value in the resulting range (which gives us Japan and a value of 9.58) and normalise all the values in the range to the value of Japan. Therefore, the value for Japan becomes equal to 1 (100%), and the values for other countries are lower or higher than 1 reflecting the degree to which broadband is more or less expensive in those countries compared to Japan as the benchmark. The results are set out in Figure 4. So, the broadband price in Australia is 36.8% higher than the benchmark value of Japan. On this scale, the countries with the most undervalued broadband (OECD countries, based on broadband/Big Mac prices comparison) are South Korea and Hungary and the countries with the most overvalued broadband are USA and Mexico. Source: OECD Statistics (http://www.oecd.org/sti/broadband/oecdbroadbandportal.htm), author calculations. However, when we compare the broadband price to average annual wages (in thousands USD), we see that that Australia has comparatively cheap broadband, taking into account the average income level. The ?cheapest? broadband among the OECD countries (adjusted to average wages) is in Korea and Finland (see Fig. 3). physical/infrastructural factors (topography, population density, telecommunications infrastructure). Demand and supply factors are basic for determining the equilibrium price for most goods and services in the economy. However in the case of broadband services there are certain peculiarities. For broadband, low demand is not associated with low price (as generally happens in the market) but rather with an inflated price. This is because broadband provision incurs significant infrastructure costs, which will be distributed among few customers in a low demand scenario. For example, Zimbabwe and Ethiopia both have very low comparative average price levels, but lack of telecommunications infrastructure means the broadband prices in those countries are among the highest in the world. The low broadband prices in Ukraine (world?s lowest in 2015, according to Numbeo) are strongly influenced by that country?s infrastructure legacy. The Soviet heritage of extensive telecommunications infrastructure, installed for state security purposes, facilitated the launch of dial-up Internet access in the 1990s, and the updating to cable and fibre in later years. This trajectory is shared with other post-Soviet countries in Eastern and Central Europe, where landline broadband services are comparatively cheap. It is interesting that sixteen of the first twenty countries with the cheapest landline broadband (according to Numbeo) are countries from the former Soviet bloc. Other, country specific, factors also come into play. An additional reason why Ukraine is currently the cheapest country for broadband can be attributed to three devaluations of its national currency (hryvna) in 2014. While the currency was devalued by 300%, Internet providers raised their prices quite moderately (by 50-100%). This is not due to governmental price regulation (Internet broadband prices in Ukraine are unregulated), but because consumer prices for most locally produced goods and services have been raised significantly less than the national currency has devalued. Regulation (?state effects? in Flamm?s (2005) term) may also affect supply in many cases. For example, Aron & Burnstein (2003) argue in the US context that governmental subsidies of local telephone services suppressed penetration of broadband, while legislative reclassification of broadband services could lead to changes in the broadband market framework and modify supply chains (Ford & Spiwak 2014). However, if we set broadband regulation within the wider neo-liberal settings promoted by the ITU and other supra-national institutions, we find significant convergence in policy and regulatory models (such as the ?ladder of investment? favoured within the EU (Bourreau et al. 2010)), that may call us to question the influence of regulation as a factor in price differences. In Australia, though ? at least on Fletcher?s (2009) account ? it has been the ineffectiveness of regulatory action in promoting market competition that has influenced broadband prices, rather than any more forceful or directive posture of the state. Topography (or what Flamm (2005) calls the ?terrain effect?) is another physical factor that directly influences the cost of broadband supply, and accordingly its price. We began this article by comparing Ukraine and Bolivia. These countries are quite close in GDP per capita (see Fig.1), but contrast significantly in broadband prices. High broadband prices in Bolivia are triggered by physical, spatial and infrastructure factors. A landlocked and mountainous country, Bolivia is denied direct access to international communications cables, which carry almost 100% of trans-oceanic internet traffic (Starosielski 2015). Hence, Bolivia currently outlays significant revenue to rent optical fibre access from Chile, Brazil or Argentina (Vargas 2014). In Australia, demand is fuelled by high GDP per capita and correspondingly high average income rate (59,400 USD in 2015), with the capacity to pay positively affecting prices. Telecommunications infrastructure in Australia is generally modern and extensively provided, in common with top OECD countries. However, telecommunications coverage is also quite uneven, being well developed in cities but worse in terms of price and data speed in rural areas. This causes unevenness of broadband pricing in different regions, a challenge that was met in the pre-Internet telecommunications environment through the prescription of universal service obligations (Gregory 2016; White 2016; RTIRC 2015; Hopewell 2014). Regulatory factors in Australia are shaped by a shift in telecommunications policy to market liberalism, involving a three-stage privatisation of the public monopoly (and currently biggest national operator) Telstra, starting from the early 1990s. This made the company more effective in terms of profit maximisation, but many customers in remote regions felt left behind as on-line services developed. The failure of private operators to provide broadband infrastructure throughout the country led to the re-emergence of a government monopoly in the form of NBN Co. Recent years have seen a process of consolidation and oligopolisation amongst Australian broadband providers. This has been dictated by the market circumstances presented by a comparatively low density of population (3.06 people per sq. km): only providers with a large customer base can achieve scale economies and profitability. Taking the other factors into account, broadband appears to be cheaper in more populated areas. Population density, one of the physical and spatial factors, is inversely related to the price of landline broadband. The correlation between population density and the price of landline broadband in OECD countries is -0.31, calculated on open (World Bank 2015) data for density of population (people per sq. km of land area) and OECD data for broadband prices. Although the correlation is low, the density of population is only one factor among other factors, so its influence on broadband price is expectedly moderate. It is interesting, though, that Australia and Canada, which are quite close in terms of GDP per capita ratio, density of population and telecommunication market patterns, have also quite close absolute values for broadband prices compared to the average level of prices. The role and significance of every factor influencing international differences in broadband prices can be only measured by econometric modeling, which would require a separate and more detailed study. Despite the prolific literature focusing on broadband penetration, regulation, marketing and the digital divide, there is a gap in our understanding of the factors that influence the significant differences in broadband prices throughout the world. In this brief study, we have undertaken two tasks. First, we have suggested some datasets and methodologies that contextualise and clarify inter-country price differences. Second, we have suggested five groups of factors that influence price differences: physical and infrastructural factors, regulation, the average level of prices, demand and supply factors. Of these factors, infrastructure is crucial: a lack of essential broadband infrastructure stifles the effect of other factors. The role of the different factors in shaping broadband prices throughout the world calls for further analysis. An extended study of the effects of different factors could usefully incorporate regression analysis that would estimate the relationship between factors mentioned in this article and broadband prices in a sample of countries. A significant challenge posed for such an analysis would be choosing proxies or estimations for qualitative categories as ?regulatory factors?, ?infrastructure? or ?topography?. As to Australia?s comparative position, we have argued, the broadband price in Australia is influenced by demand (demography) and physical and infrastructure (topography and telecommunications infrastructure) factors, in addition to the terms under which market liberalisation was introduced. However, evaluation of the broadband price to Big Mac price ratios suggests that it is overvalued in Australia by 36.8%, compared to the benchmark value of Japan. Some analysts warn about the lack of entry-level wholesale (NBN) pricing, and inflated profit margins of ISP retailers, as checks on broadband adoption for low-income Australians (de Ridder & James 2013; Morsillo 2012). Notwithstanding the importance of understanding that broadband consumers are not uniform, viewed at country level the average price for landline broadband is still moderate, taking the Australian average level of income into account. Biggs, P; Kelly, T. 2006. ?Broadband Pricing Strategies?, Info, 8(6): 3-13. Bouckaert, J; van Dijk, T; Verboven, F. 2010. ?Access Regulation, Competition and Broadband Penetration: An International Study?, Telecommunications Policy, 34(11): 661-671. Bourreau, M; Dogan, P; Manant, M. 2010. ?A Critical Review of the ?Ladder of Investment? Approach?, Telecommunications Policy, 34(11): 683-696. Falch, M. 2007. ?Penetration of Broadband Services: The Role of Policies?. Telematics and Informatics, 24(4): 246-258. Falkner, M; Devetsikiotis, M; Lambadaris, I. 2000. ?An Overview of Pricing Concepts for Broadband IP Networks?. IEEE Communications Surveys & Tutorials, 3(2): 2-13. FCC (Federal Communications Commission). 2015. 2015 Measuring Broadband America Fixed Report. Available at: https://www.fcc.gov/reports-research/reports/measuring-broadband-america/measuring-broadband-america-2015 [Accessed 29 Sep. 2016]. Flamm, K. 2005.?The Role of Economics, Demographics, and State Policy in Broadband Availability?, LBJ School of Public Affairs. Available at: http://bear.warrington.ufl.edu/centers/purc/DOCS/PRESENTATIONS/events/0205%20LBS/papers/Flamm-flammbb0205.pdf [Accessed 05 Oct. 2016]. Flamm, K; Chaudhuri, A. 2007. ?An Analysis of the Determinants of Broadband Access?, Telecommunications Policy 31: 312-326. Fletcher, P. 2009. Wired Brown Land? Telstra?s Battle for Broadband. Sydney: New South Press. Ford, G.S; Spiwak, L.J. 2014. ?Tariffing Internet Termination: Pricing Implications of Classifying Broadband as a Title II Telecommunications Service?. Phoenix Center Policy Bulletin, (36). Gregory, M. 2016. ?The Rationale for Universal Access to Digital Services?, Australian Journal of Telecommunications and the Digital Economy, 3(4): 166-184. Hopewell, L. 2014. Report: Most Australians Have Crappy Internet Speeds. Available at: http://www.gizmodo.com.au/2014/01/most-aussies-have-crappy-internet-speeds [Accessed 29 Sep. 2016]. ITU (International Telecommunication Union). 2015. The State of Broadband. Available at: http://www.broadbandcommission.org/documents/reports/bb-annualreport2015.pdf [Accessed 11 Sep. 2016]. McLean, R; Sharkey, W. 1993. ?An Approach to the Pricing of Broadband Telecommunications Services?, Telecommunication Systems, 2(1):159-184. Morsillo, R. 2012. ?Affordable Broadband for All Australians?, Telecommunications Journal of Australia, 62 (5): 80.1-80.16. Nevo, A; Turner, J; Williams, J. 2016. ?Usage-Based Pricing and Demand for Residential Broadband?, Econometrica, 84(2): 411-443. Numbeo. 2016. Price Rankings by Country of Internet (10 Mbps, Unlimited Data, Cable/ADSL) (Utilities (Monthly)). [online] Numbeo.com. Available at: http://www.numbeo.com/cost-of-living/country_price_rankings?itemId=33 [Accessed 15 Sep. 2016]. OECD. 2015a. Monthly Comparative Price Levels. Available at: https://stats.oecd.org/Index.aspx%3FDataSetCode%3DCPL+&cd=1&hl=en&ct=clnk&gl=au [Accessed 09 Sep. 2016]. OECD. 2016a. OECD Broadband Portal - OECD. Available at: http://www.oecd.org/sti/broadband/oecdbroadbandportal.htm [Accessed 11 Sep. 2016]. OECD. 2016b. Average Annual Wages. Available at: https://stats.oecd.org/Index.aspx?DataSetCode=AV_AN_WAGE [Accessed 15 Sep. 2016]. OECD. 2016c. OECD Broadband Statistics Table 3a. OECD Fixed (Wired) Broadband Penetration and Population Densities. Available at: https://www.oecd.org/sti/broadband/39574903.xls+&cd=1&hl=ru&ct=clnk&gl=au [Accessed 5 Oct. 2016]. Polykalas, S; Vlachos, K. 2006. ?Broadband Penetration and Broadband Competition: Evidence and Analysis in the EU Market, info, 8(6): 15-30. Rogers, S. 2016. ?Bridging the 21st Century Digital Divide?, TechTrends, 60(3): 197-199. RTIRC (Regional Telecommunications Independent Review Committee). 2015. Issues Paper. Available at: https://www.communications.gov.au/sites/g/files/net301/f/RTIRC_Independent_Committee_Review_2015_FINAL.pdf [Accessed 04 Oct. 2016]. Samuelson, P. 1994. Facets of Balassa-Samuelson Thirty Years Later. Review of International Economics, 2(3): 201-226. Schneir, R.J; Xiong, Y. 2016. ?A Cost Study of Fixed Broadband Access Networks for Rural Areas?, Telecommunications Policy, 40(8): 755-773. Starosielski, N. 2015. The Undersea Network. Durham, NC: Duke University Press. Summers, R; Heston, A. 1991. ?The Penn World Table (Mark 5): An Expanded Set of International Comparisons, 1950-1988? The Quarterly Journal of Economics, 106(2): 327. The Economist. 2013. The Big Mac Index. Available at: http://www.economist.com/content/big-mac-index [Accessed 10 Sep. 2016]. Vargas, J.E.G. 2014. 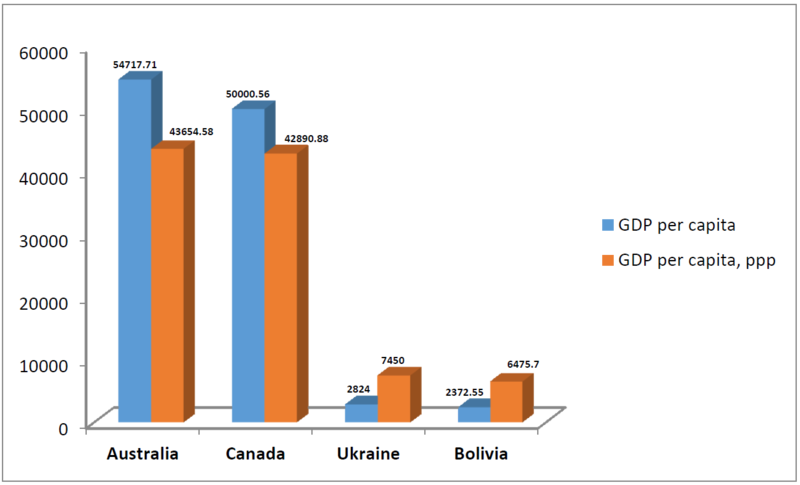 ?Universal broadband access in developing countries-The case of Bolivia?. In Global Humanitarian Technology Conference (GHTC), 2014 IEEE (pp. 597-602). IEEE. [Accessed 06 Dec. 2016]. White, N. 2016. ?Australian Internet Costs 17x More than Europe Thanks to Telstra Optus?. [online] Available at: http://www.dailymail.co.uk/news/article-3748287/Security-company-claims-Australian-bandwidth-costs-17-times-Europe-thanks-Telstra-Optus.html [Accessed 29 Sep. 2016]. World Bank 2015. Population density (people per sq. km of land area) | Data. Available at: http://data.worldbank.org/indicator/EN.POP.DNST?order=wbapi_data_value_2014+wbapi_data_value+wbapi_data_value-last&sort=desc [Accessed 05 Dec. 2016].